What is Munchausen Syndrome by Proxy? Very briefly, it’s a rare form of child abuse where a caretaker, usually a mother (statistically speaking), takes a child into the medical system, doctor’s offices and clinics, and fakes or feigns or makes up symptoms. The child is not sick or just has a small symptom and they drum it up, they outright make up lies to say the child has this, the child has that. Overtime, one of the symptoms of this type of abuse is a child is in the hospital all the time, and lots of different doctors. This parent goes doctor surfing. I’ve seen this all by the way, firsthand, and I’m speaking from experience and from what I’ve also learned with books and on the internet and on Youtube. It’s a really, really sick form of child abuse because it flies in the face of everything a parent with a conscience is supposed to do. You are supposed to want to help your child. You don’t want them in the hospital. That’s what so twisted about this form of child abuse is the Munchausen parent wants the child in the hospital, and when the child is suffering, guess what? They are okay with that. Does that sound like a normal type of parent to you? No, it’s a really decrepit form of child abuse. Fortunately it’s rare but I’m talking about it because a lot of people in the child protective care system, the guardians, ad litems, judges, lawyers, doctors, they don’t understand this form of child abuse. You and I can’t understand this but it exists. It’s out there more than what the literature that I read about says. It’s much more common than the books I read, and the literature I’ve read on it talk about. I’ve seen it, I have a friend that saw it, my sister is very intimately acquainted with this from things she’s seen as a nurse. It’s out there but sadly the professionals just don’t know about it. Let me give a couple of telltale signs. These are signs that happened to me, this can help you in your situation, if you are thinking this might be happening to your son or daughter or lover. First of all, these parents like to doctor shop, they don’t just go to one doctor over the course of three five years, with a little Johnny or a little Suzie. No, they go a lot. In my case it was well over a dozen doctors by the time my son was twelve. Also your son or daughter, this kid that we are talking about has lots and lots of medications. My son at one point had over nineteen prescriptions that fell over eighteen months. It’s insane, yet when my son was with me, guess what? During extended periods of time, he was healthy. There is nothing wrong with them, yet when he went back to mother, guess what? He’s back in the hospital again. One quick example, during summer, I got him weaned off of miralax, which is a constipation medicine to help with constipation. I weaned him off of it with good, basically good eating. Fibrous foods, lots of foods with roughage and I weaned him off it, and I was proud of that I let mom know that. She was not happy with that, guess what? The very next week, my son was back at the doctor’s office. Guess who suggested that he get put back on miralax? This doctor. Again, I don’t think this doctor, this doctor was just duped, he didn’t know better, the other thing is, what doctor wants to stand up to a mother or father who is saying, “Hey, little Johnny or little Suzie has X, Y or Z.” Here is probably the biggest tip off to Munchausen parents, it’s the fact that they are not happy when the child is healed or when the child is recovering or fixed. Most parents would be like, “Yes, finally, we don’t have to come back to this stupid hospital.” They are the opposite, they’ll bring a child back for more. In fact, very frequently they will dial it up. They will actually take exaggerated symptoms and say, “No, this is not what the child needs, they need this, this and this.” How would they know? That’s because they are frequently nurses themselves. Munchausen parents are frequently coming out of the medical profession themselves. That’s all upside, this form of child abuse really if you think about it, it’s all upside down. Everything that looks like X, there is no way it could be anything as actually Y or Z, it’s really strange. I just wish more people knew about this form of child abuse. Here is another interesting thing is, Munchausen parents know details, they know about medicines, they know about detailed medical procedures. They will stand up and say, “No, my son, my daughter needs this. My son, my daughter needs that.” They take an active role in basically taking over the medical care and suggesting that these are the meds that he needs, here is the procedure that he needs or that she needs. Again, that’s one of the reasons they go doctor shopping because a lot of doctors will say, “You know what? No, I don’t see it that way.” Munchausen parents can get very upset and that’s why they go and doctor shop. It’s usually done on younger kids under the age of six. That is the pattern, and let me sum up real quickly, the pattern of the Munchausen parent. The parent is not happy when the child is fixed, the doctor shops. It’s not uncommon for a dozen different doctors over a dozen different years that the parent has gone to. They are very frequently in the medical profession themselves, the most common profession for a Munchausen parent is a nurse. Details, they know a lot of details about medicine and especially about drugs. The last one that I haven’t talked about yet is the child misses a lot of school. In my case, my son missed fifty days full or partial in one particular school year that this all was going on. That’s another telltale sign. If you add up all this together, it points towards a parent that’s got Munchausen Syndrome by Proxy. What are the solutions? You know what? I’m not a doctor, I’m not in the legal profession, but the best solution is really is to remove that child from that home. How? I don’t know, please give me your thoughts and feedback in the comments below in this video. I don’t know, as short of removing that, clearly this is, I think we’ll all agree, this is an abusive home where this happens. We’ve got to remove the children from that home. How to do it, short of putting video cameras in every single clinic and every single doctor’s office around America? I really don’t know. That’s in a nutshell this form of abuse. It needs, the awareness needs to get out there that this exists. Right now, sadly, a lot of people that are supposed, that are tasked with protecting children whose parent fail them don’t know about it. That’s what I’m doing with this video. I’m hoping to spread awareness of it, and please share in the comments sections, please, please, please. Share in the comment section your experiences, if you’ve been this child who’s had to deal with this stuff. Please add onto what I’m talking about here today and tell us what are the symptoms, what are the kind of things that they did to you and how did you recover, and what are some of tips you can give us to help teach other people? Once I get, once those fall in, I would love to do another video sharing insight and maybe some really effective tips or strategies to try to counter this really wicked form of child abuse. Thanks for watching. 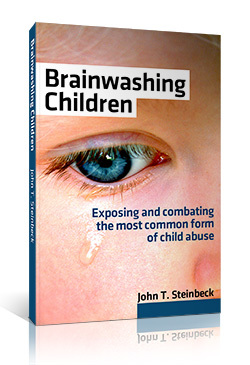 John Thomas Steinbeck is a parental alienation consultant. He and his son's relationship was under attack in a deplorable campaign of parental alienation. In this blog, John shares his insights, techniques, and tools in combating emotional child abuse. He did it-- today his son's love has been restored-- and you can too!